Upon entering, I notice families at every table, leaning in and chatting with wide smiles as they pick and choose from the variety of dishes on the table. 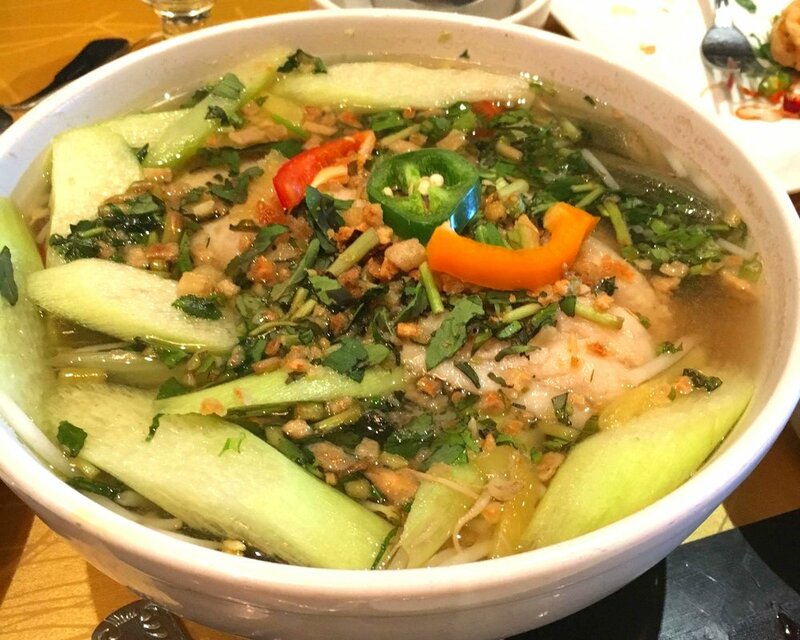 Vietnamese cuisine is my favorite to devour, and I am so grateful to live so close to Eden Center in Falls Church, the mecca of Vietnamese cuisine in the area. If you haven’t ventured to the area to explore this culinary wonder of the world, add it to your list. Now, what did I eat? The first thing I always order when Vietnamese is on the menu are the crispy spring rolls, known here as the Silken Shawl Imperial Autumn Roll. Some of the best I’ve ever had are at Nam Viet in Arlington, VA. But, the crispy spring rolls at Present are truly wrapped with a bow made out of super crispy rice threads, which Chef Gene painstakingly makes every morning in the style of a what I can only describe as a Vietnamese funnel cake. The piped batter is intricately rolled around the traditional ground pork and shrimp mixture and baked for extra crispy, minimally greasy finger food. The highlight of a Vietnamese crispy spring roll is the dipping sauce – pungent umami fish sauce with lots of lime and chili. I will drink this at the first sign of acceptance. The creativity and time devoted to this appetizer makes it unique to any in the area, so do not overlook it. Another showstopper at Present are the Rainbow White Clouds – a delicate circular rice cake topped with a few dried shrimp, a dash of heat, and a sprinkle of crunchy peanuts. These are insanely addictive. The soft and chewy texture of the dumpling is similar to mochi and slides off into your mouth like a slippery dumpling. The flavors are simple but impactful as you chew them together while reaching for another one to slurp up. Again, the labor of love it takes to create each dumpling on their own shallow dish is astonishing, and I am in awe to be dining on such precisely crafted creations. Everything is made in house, from the crispy garlic and lemongrass to the kimchi, and you’ll be asking to take all of it home with you for epic rice bowls and kimchi eggs the next day. One thing I often overlook when dining out are the soups. I’m confident my life changed for the better after trying the fish soup at Present, Open Field in the Sunset Soup. The sweet and sour broth was incredibly light, and bright with lime and vinegar. Fresh chilies added heat, sometimes unexpectedly HOT (I may have choked embarrassingly at the table, but that didn’t stop me! ), and the fish was just cooked in the hot broth, flaky and succulent. Finished with pineapple, tomatoes, and herbs – I want this for every hangover in my future. Are you into instagrammable presentations while you’re dining out? Then the Shrimp in the Fresh Ocean is for you. Not only is it dramatically plated on a hollowed-out pineapple, the dish itself is a delight. Sweet and crunchy shrimp are paired with tart pineapple, this dish is a crowd pleaser. I love to find out what chefs eat outside of their restaurants, and especially when they’re hangry. For Chef Gene it’s soup (I can see why – that soup is FIRE). It’s something he can whip up with ease and who doesn’t feel better after a big bowl of soup? For General Manager, Tom, it’s kimchi and anchovies with basmati rice. He typically has all of these things already made in the fridge and can throw together a tasty rice bowl in no time. After my feast at Present, I made this dish one of my go-tos. It is full of salty, funky, flavor that leaves you full and satisfied for hours. It’s impossible to list all of the dishes you should order at Present, because each one is spectacular. 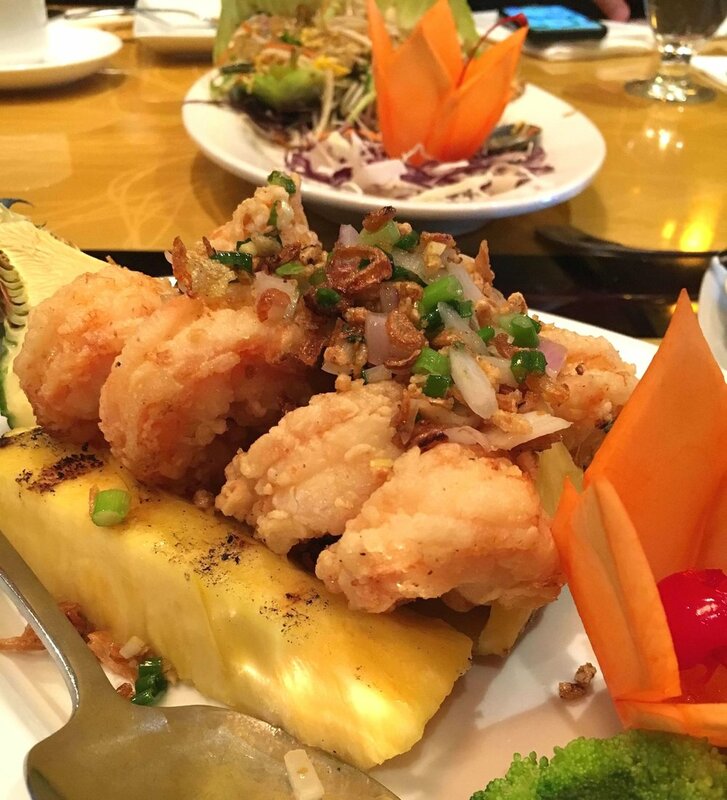 Some other noteworthy bites are the Treasure from the Sea – a salad of pineapple, julienned carrots, onion, lemongrass, fried garlic, peanuts, shrimp, and ivory calamari on hollowed half pineapple. The textures and flavors lend a combination resembling a next level ceviche. The Beef in Black Pepper Sauce is a classic – beef tenderloin served sizzling with green onion, black pepper sauce and rice. A fail-safe dish. The Basking on a Sandy Beach features two crispy solf shell crabs with lots of salt and pepper, which will surely be gone in seconds of passing them around. Sweet and succulent crab simply seasoned and enrobed in super crispy batter - how could this ever be bad? For a strong finish, go with the Warm Heart Piglet – caramelized slices of pork cooked in a clay pot. If you’re craving something sweet after your feast, order a Vietnamese iced coffee for the road as you revel in the meal you just shared with your loved ones. As Chef Gene reminds us, Present Restaurant focuses on mindfulness. Who we are at this time, the things we can do, and the people surrounding us are the main elements that have the ability to bring us happiness. These are all of the presents that life has offered us. Whether we can receive them or not, depends entirely on our ability to be present in the moment and enjoy them. So, at this very moment, and at this place, what are we doing? Let’s shed all of life’s sorrows from the past, or worries of the future so we can enjoy our family and friends, who are with us at the time, as well as the food presented before us. Since eating is an important part of our existence, let’s do it mindfully. I urge you to be mindful while visiting this treasure of a restaurant, Present.